Welcome to the Official Tamara Wellons Music Website! Receive a FREE music download when you join. For modern R&B singer Tamara Wellons, it’s been a beautiful struggle. 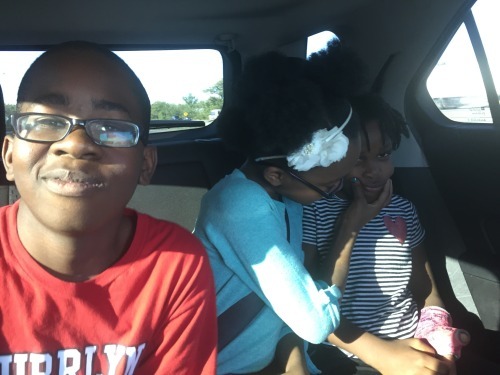 It’s not easy being an independent artist with a family, but she’s found rewards in the journey. Aptly, she calls her third album, Pretty, and its birth has reconstituted her soul with wisdom and enlightenment. Airquote "Ladylike:" A Concert of Women Musical Theater Creators at the Kennedy Center's 2018 Page to Stage Festival! Tamara Wellons embarks on the private Experience Tour with band members from the MD/DC/VA area. Intimate concert and conversations with Tamara & musicians. Songs for Janie is a conceptual music project and concert inspired by Zora Neale Hurston's literary novel, "Their Eyes Were Watching God." Tamara's music serves as a 21st Century epilogue to the 1937 Black American story of womanhood, self-worth, freedom and love. RoundGlass Music Awards recognise the most enlightened musicians who create music for Wellness, Peace and Environmental Consciousness. 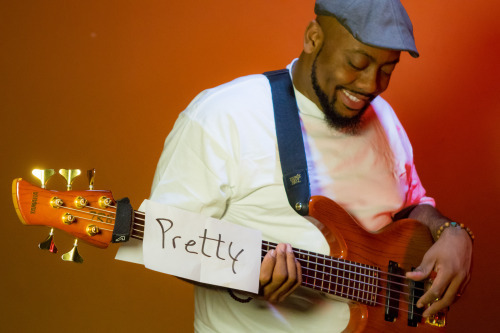 Kinard Cherry holding the words pretty on his bass guitar. She called me her daughter from day one even before I accepted. She knew her son was serious and for that love, she opened her heart to me. Thank you Ms. Wanda. I didn’t know whether to call her Wanda, Ms. Wanda or Ma, so I called her all three on different occasions. I wish I’d called her Queen while she was here so her ears could hear it come from my mouth. Queen Wanda. The stories, I have them. She made sure I knew the stories and I knew who she was and who she had become because of them. I listened not knowing that one day, I’d be a keeper of those stories for her grandchildren and great-grands one day. 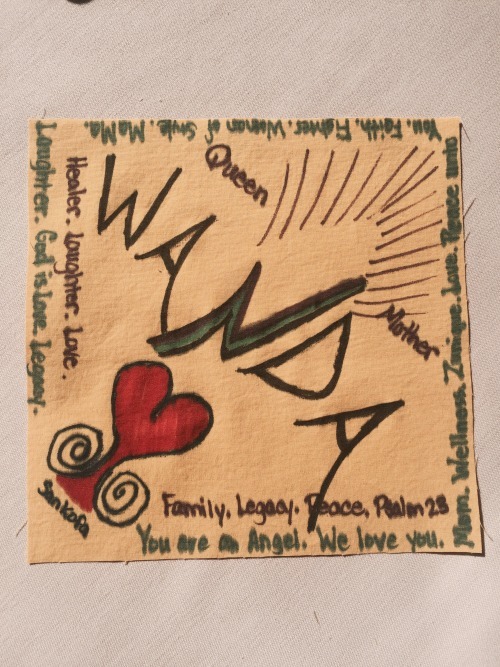 A healer- I watched how she cared and just one day before her last, Ms. Wanda was taking care of Kinard with a foot detox. A giver- she ALWAYS had something for me- a plant (take this aloe & did Kinard give you the pots), clothes, food, pretty vases , and a few more plants. One of her last instructions to me was to give the plant a bigger pot. I love you too and I wish I’d told you more. Three short years but I have your love locked in my heart for eternity. I just wanted one page more. I usually put myself into the character’s shoes but not this time. This time I just watched Ruby and Ephram, and listened to the backstories of Celia, Chauncey, the Reverend and everyone else…Maggie. I can only let out a good southern grunt and turn my head when I think about Ruby Bell’s story, Marion Lake, chinaberry trees and her town. Of course, I needed to read this book while writing Pretty and finishing the Behind the Veil EP. The spirit knew I needed this book well before I came to the title of the new album. That’s how it works with me. Pretty is very much a ghost story as well. I will say though that this book could not come with me into the fall and winter because I would probably sink in to an abyss of muddy water with the shorten days, long nights and an obligation to reread each page. No one would have seen me. 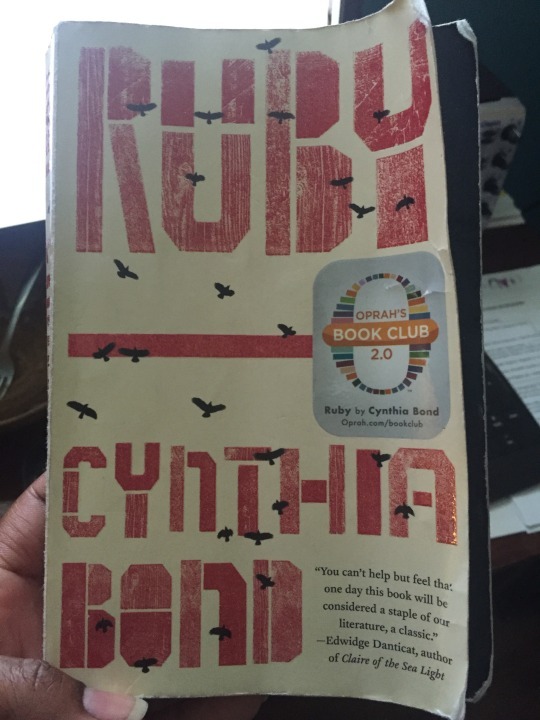 Ruby made me wonder about the many untold stories in my own southern family and it made me think about why people behave the way they do and what spirit drives them. I had not gotten so close to any human trafficking story so I was educated as well. Some parts were so hard to read that I waited more than a week, reading other short reads in between chapters. The poetry in this book just oozed & overflowed and it made me fall in love with words so much that I didn’t want the book to end. I’m a re-reader and even with the kind of sadness and exuberance the book gave me, it will be a little while before I read this book again probably because it’s heaviness. However, I would surely watch the series on Netflix. This story could very well be a horror/drama/historical fiction/suspense….. When I came to the last page (no spoiler here), I felt an urge for hope and I pleaded for triumph. I felt hurried and wanted to press the brakes because I wanted one more page. I promise to share. Thank you so much Ms. Cynthia Bond. And this one struck a nerve with me…. It struck a chord for two reasons. One, my mother always told me this, “You pretty.” So I carried myself like so. Two, what does that (being pretty) mean? What value does that give? What a topic to explore….Pretty. There are two sides to this coin. Many worldviews have been more than striking chords with me lately. It won’t let me sleep and its moving me to create…to say something. The next 30 days of August led to a have important social and historical conversations, many conversations and interviews about pretty, conversations about American history, and a document filming of my hometown where we explore the topic Pretty. I introduce to you my new project to be released at the top of the year.